So team event has more oil/longer pattern? I haven't cashed in 6 years. Course, I haven't gone in 6 years. Not since my knee went out. The group I used to go with is there now. They will return by Friday. Had I gone, I would have stayed to meet you. Bowled team yesterday. I was told team oil is about 35 feet, while dbls/singles is 48 feet. Those could be wrong, just what I heard. I started w/ my DV8 rukos skitzo(sp? ), mainly cuz my thumb had swelled and the thumb hole there is larger. 1st game was hard to find a shot, but I too did eventually settle in hitting the 8 board and going up an at em. Needed something stronger though so 2nd game I switched to the Kattana dragon. That ball could definitely recover on the back end, shot 234 second game, after having just a 156 1st. Continued w/ the dragon thru the 3rd game but it finally burned me in the 10th w/ a split, leaving me w/ a 168, so 558, not great but not horrible I guess. 6 opens I think? all but 1 were splits. Bowled 40 frame, but couldn't quite reach 1000. Some of my doubles partners there shot 1100 so I should at least cash in a few doubles, however I got the big whammy so I walked out w/ $120. good enuf for me, anything else will just be gravy. we'll see how sing/dbls goes tonight. did NOT bowl well in singls/dbls. Really struggled trying to find a playable line. Tried going up an at em down 8'ish but w/ the longer pattern couldnt get a consistent return to the pocket. So continued to experiment all over the lane. Once u got outside 10, it was headed straight to the 6/10 pocket, whereas in team, my ball could actually recover out there, as long as it wasnt too far out there. Eventually i settled on playing inside, around the 3rd arrow. Had to soften the speed just a bit to get the ball to recover but was finally able to roll off a couple decent games at the end, 206 and 223. Wanted to try to at least cash in singles, which hopefully i should w/ a 597 (168 1st game). low to cash is 594. I guess it mostly sucked, but I spose it could of been worse. Better luck next year I guess. Unlike the Pros, who get to practice on the specific lane condition, Nationals doesn't allow it. 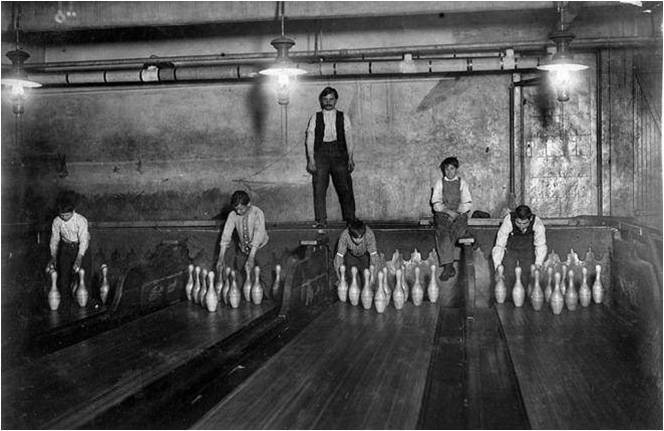 It was common for the National shot to be issued to bowling lanes to lay down so the local bowlers could practice on it. That is not allowed today. Our old house, used to put the shot down on 6 lanes for practice each Sunday. It was so popular, we had to take reservations for use. And, I don't know why? Why should the shot be kept secret til you show up? And, then, not allowed to practice on it? Unlike a golf green, where you can see the undulation, most can't see the oil on the lane. And, when the lane is buffed, it's even harder. So, why is the pattern held in secret? I contend, most accomplished bowlers CAN succeed if they practice on the condition. Course, I would be told the lane surface under the oil is different for all and humidity affects the oil, or when it is laid down makes a difference. Why all of the mystery? To me that still doesn't explain how theres an out of bands when theres less oil on the outside. but then I obviously don't know much about oil graphs. However, isn't the Bowlers Journal oiled the way one of the events is oiled? I seem to recall back in Reno, for I think $100 your team could practice on the team pattern w/ a pro/coach downstairs in the showcase lanes. Course I think that was the last year we got to see the pattern revealed before the tournament, so that likely wont happen in 2020 when we get back to Reno. When the USBC first announced that the patterns would be kept a secret I didn't like it but after bowling in the Open for the past two years and really following the tournament closely I think it's the right decision. I think it just gives the pros (and top amateurs) too much of an advantage. I think they would do much more with that info than us mere mortals that are competing with them in the regular division. I think you can prepare for the tournament without bowling on the actual shot as well. I did so by bowling on the house shot and working on accuracy plus playing a few different lines for scenarios that I might run into. There's enough information on the internet about how the pattern plays as well so one can make educated equipment choices before going out there. I'm not sure I would have bowled any better if I had bowled on the actual shot. Also the Bowlers Journal is on the doubles and singles pattern so technically you can bowl on both patterns prior to bowling the Open since you can still set up a practice session on the team pattern.